PDQ (Pretty Damn Quick) is an open source software package that supports the constuction of queueing models for calculating performance metrics associated with computer systems, data networks, manufacturing systems, fab lines, supply-chain management, etc. It is not a simulator and therefore is guaranteed to calculate the correct steady-state statistical means. It can, of course, be used in combination with a simulator. The example below shows how PDQ was used to find errors in a communications-network simulation. 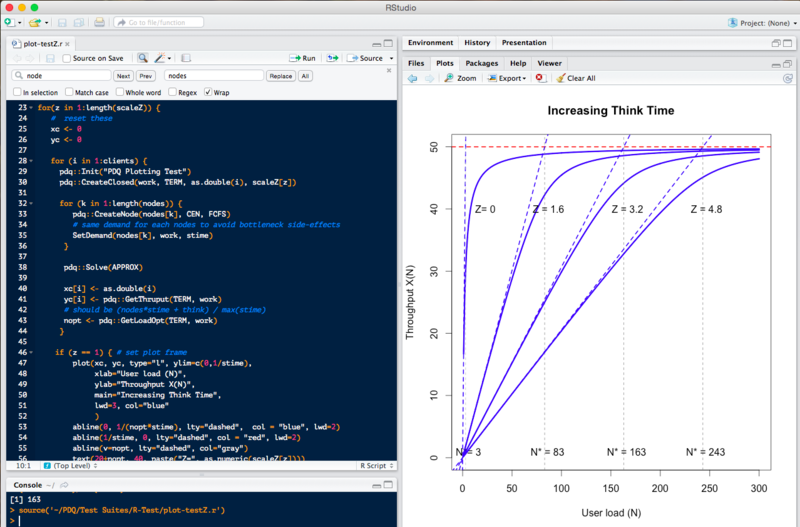 R is an open-source system for statistical computation and graphical display of data. It consists of a language called R (based on the original language called S) together with a run-time environment that supports graphics, a debugger, access to certain system functions, and the ability to run programs stored in script files. For more information about R, read this FAQ. This combination R and PDQ is particularly powerful for doing computer performance analysis and capacity planning. Download it separately from the Performance Dynamics web page. Install it using the sudo make command for the top-level make file in the PDQ download. This means you will need to have root privileges. A training class, which includes instructions on how to apply R computer performance analysis and capacity planning, is held every August in California. The following PDQ-R example is the same as the communications network example shown in PyDQ (Python PDQ) and is based on the following queueing network diagram. This Jackson queueing network is a good example because it demonstrates the intrinsic ability of R to solve a set of simultaneous linear traffic equations within the same script that contains the PDQ model. The queueing nodes Comp1, Comp2, Comp3 have been relabeled Router1, Router2, Router3 in the PDQ-R code and the Greek λ symbol for network traffic is denoted simply by L.
Running this R script, produces the following PDQ report. New versions of PDQ are released periodically. Please fill out this form if you would like to notified by email. File translated from TEX by TTH, version 3.81. On 4 Sep 2015, 06:20.